DDC offers online support resources, along with a large network of Field Service Representatives and Applications Engineers, providing technical assistance, and on-site customer support. DDC's field proven technology is integrated into the world's most advanced civil aerospace, defense, industrial and space applications. Data Device Corporation (DDC) is a world leader in the design and manufacture of high-reliability Connectivity, Power and Control solutions (Data Networking Components to Processor Based Subsystems, Space Qualified SBCs and Radiation Hardened Components; Power Distribution, Control and Conversion; Motor Control and Motion Feedback) for aerospace, defense, space, and industrial applications. DDC is the market leader in high-reliability data bus networking solutions, including sub-systems, boards, components, and software for the defense, civil aerospace, and space markets. DDC provides data bus solutions for MIL-STD-1553/1760, ARINC 429/717, Fibre Channel, Ethernet, CANbus, Serial I/O, and other protocols. DDC offers proven smart power control and power conversion solutions that enable land, sea, air, and space vehicle systems the ability to control and distribute raw and conditioned power, more efficiently and reliably. Power management with DDC's Solid-State Power Controller (SSPC) solutions offer dramatic SWaP-C saving advantages over the electromechanical switches, relays, and circuit breakers they replace. DDC's power conversion and supply solutions, offering greater than 92% efficiency, provide high quality conditioned power in a space saving, reliable, and field-proven, "fit and forget" design. DDC is a leader in high reliability motor control and synchro/resolver motion feedback solutions for defense, civil aerospace, space, and industrial applications. DDC's motor control solutions deliver high reliability postion, torque and speed control, while our synchro/resolver motion feedback solutions provide high accuracy positioning, direction and speed data for high reliability applications. DDC is a leader in high reliability transformer, magnetic and cable assembly solutions for the aerospace, defense, and space industries, with Beta Transformer and North Hills brands offering field proven magnetics solutions for the most demanding environments, including extreme temperature, shock, vibration, dust, fluid, and radiation. DDC is a leading supplier of space qualified SBCs and radiation hardened components. Utilizing multiple radiation hardening techniques, DDC's space solutions incorporate one or more of the following elements: RAD-PAK® technology, Rad Hard by Design, Triple Mode Redundancy (TMR), and Error-Correction Codes (ECC). DDC's space-qualified and field proven solutions are engineered for space’s extreme environmental requirements, while reducing space, weight, and power consumption, along with total cost of ownership. 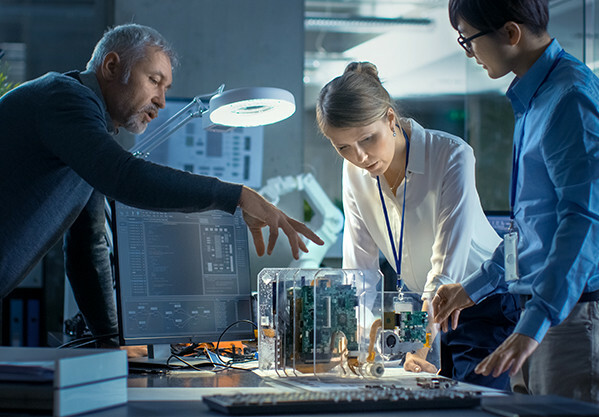 DDC’s core competencies and unique suite of capabilities for the production of custom solutions span every stage of development including electrical design, mechanical design, test engineering, process engineering, manufacturing, and product assurance. DDC is uniquely qualified to support a wide range of application requirements and technologies based upon our decades of experience in analog and digital microelectronics, magnetics, power supplies, radiation mitigation technology and top quality certifications for AS9100 Rev C, ISO 9001:2008, EN9100, JIS Q9100 and through the DLA MIL-PRF-38534. A Plastic Components: The Lead-free option for these products is available with a Matte Tin finish. DDC can provide the reliability and tin whisker growth data associated with these products; however, tin whisker growth is dependent on the application environment and customers should collect their own reliability data and perform a risk assessment based on their individual requirements. World's smallest, ultra low power, fully integrated MIL-STD-1553 BGA package, complete with 1553 protocol, 2 Mb RAM, transceivers, and isolation transformers inside a single package €” saves space and simplifies 1553 design and layout. Would you like to receive an email notice when this file is updated? Yes, Keep me up to date! Data Device Corporation is ISO 9001:2008 and AS9100, Rev. C Registered. ©1995-2019 Data Device Corporation. All rights reserved.